At our church meeting in February, I presented the Annual Report to our church. 28 pages with written reports from all different parts of our church passed without comment. Hours of work and not a question. I came away, wondering if we needed a better way for the church to engage with the life of the church. In the church year, tomorrow is the last Sunday. We’ve turned the building into a journey. 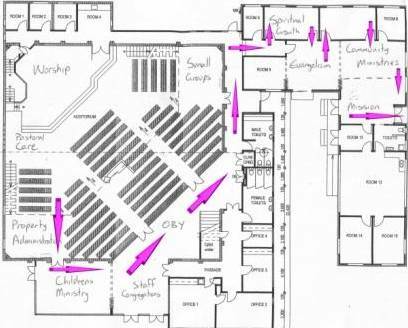 People will be invited to wander through the building, on the way out to a barbeque lunch, taking the time to engage with the many facets of the church. So much has happened in the church this year. They’ll walk through the newly painted foyer, past the recently purchased coffee machine, through the 24/7 prayer room and the newly painted Sunday School classrooms. Displays of various ministries are located throughout the building. There are photos of various events and comments from participants in various church ministries. There are videos and TV’s going. There are (the recently purchased) sofas to sit and talk to the leadership about concerns and dream. There is a coffee machine and a bouncy castle. There is a free barbeque for lunch and tea. Jason, our Community Development Pastor has done a great job of getting people involved. We’ve called it open home, open year and so we’ve also letterboxed, inviting the community and local groups. The weather forecast is good and it’s shaping up to be a great way to celebrate the life of the church over the year. How did the congregation respond? Did you find it to be more effective and engaging or did people still just come for the meeting bit and go home?